← Heaven Help Our Drinking Water: How many frac hit damages when Encana fracs multi-stacked, 60 wells per section? Attorney General of Canada “Breaks rules in Court. All. The. Time.” Fails to File Statement of Defence within 30 days. In Ernst vs Encana, Encana filed Statement of Defence more than 2 years late; Alberta Environment more than 3 years late; AER never filed, with their lawyer Glenn Solomon bragging about it. In 2014, in a hearing on a preliminary matter in Ernst vs AER at Court of Appeal of Alberta, the judges, without any warning, suddenly wanted to hold a trial right then and there without allowing any preparation for it. But then the judges realized they couldn’t hold a trial (to their great disappointment) because AER had not yet filed a Statement of Defence. Are Alberta judges and their “rules” of court fascist? “It is not because you are the Attorney General of Canada that you can act as if the Rules do no apply. 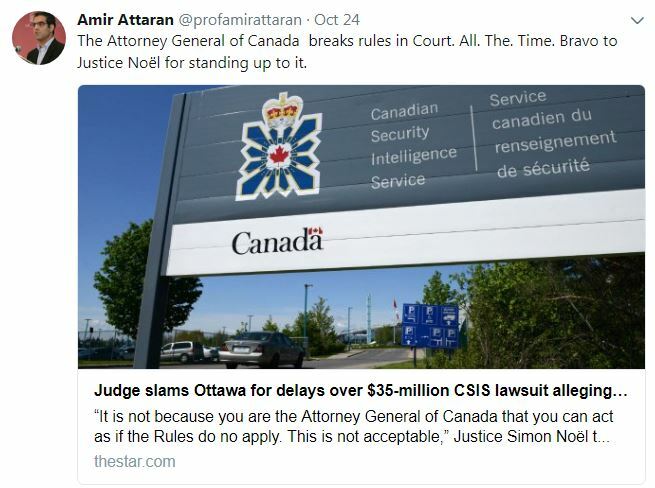 This is not acceptable,” Justice Simon Noël told government lawyers in a September conference call, according to a transcript obtained by the Star. A federal judge has slammed the Canadian government for not responding faster to a lawsuit launched by five intelligence officers and analysts who allege that they were bullied and harassed while working at Canada’s spy service because they are gay, Muslim or Black. The Star obtained a redacted transcript of the call, which was filed with the federal court this week. At issue is the government’s delay in filing a statement of defence regarding the $35-million lawsuit, which provided detailed accusations from inside one of the country’s most secretive organizations. The 54-page statement claim was filed in July and alleges that the Canadian Security Intelligence Service is run like an “old boys’ club,” creating a toxic work environment. One email cited in the claim, allegedly sent by a manager to a Toronto intelligence officer reads: “Careful your Muslim in-laws don’t behead you in your sleep for being homo.” The complainant, who goes by the pseudonym “Alex,” is gay and has a Muslim partner. A statement of defence is usually filed after 30 days unless an extension is granted. Department of Justice lawyer Gillian Patterson told the judge that there was a misunderstanding about filing deadlines. While the Department of Justice may be slow to respond, reaction from CSIS’s director to the allegations was swift. Soon after, he invited the five complainants and their lawyer to his office. According to those who attended, he listened intently for nearly three hours, as boxes of Kleenex were shared around the table. Alex and “Bahira,” a Muslim intelligence officer with more than a decade of experience who is also part of the claim against CSIS, agreed to speak with the Star on the condition that their identities were not revealed. In both court documents, and during the interview last month, they used pseudonyms. — A witness’s comment about alleged harassment at CSIS, according to a statement of claim filed in Federal Court in July. Under Canada’s Security of Information Act, identifying a spy can be considered an offence. All five of the complainants are still CSIS employees, but are on medical leave due to mental and physical conditions. None of the allegations against CSIS, which was recognized by Mediacorp Canada Inc. as one of Canada’s top 100 employers for 2017, have been proven in court. Alex and Bahira said the stress of suing CSIS and the publicity it has generated has taken a toll. In the only interviews they have given, they said they felt they had no choice but to sue in order to get the attention of the government.